Illumine uses Sermon Series to help build narratives both in individual services and throughout the series. 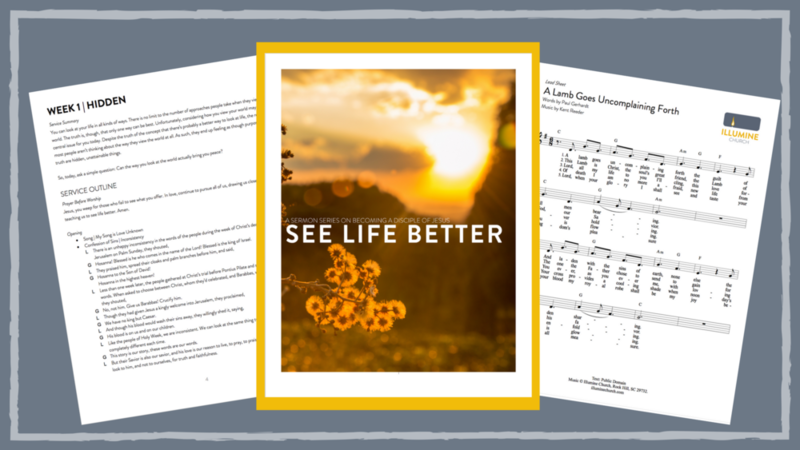 We won't write your sermons for you, but we can save you time by providing you with the resources necessary to put these ideas in front of your people. A detailed guide that includes orders of service for each week of the series, responsive readings, descriptions of the different elements of each service (such as Children's Sermons and Scripture Readings), and information about the songs utilized throughout the series. For any songs that are Public Domain or created by Illumine, we have included Lead Sheets and Piano Music (where applicable). For any songs that are copyrighted, we provide links to where you can find sheet music and/or chord charts. For any songs that Illumine has created, we provide an MP3. For any songs that are Public Domain, we provide a demo MP3. For any songs that are copyrighted, we provide links to where you can download an MP3 (sometimes for free). For use in posters or on social media, we provide multiple sizes of the series images to suit different purposes. If you make use of projection, our slide templates provide clean, thematic backgrounds that tie your projection to the artwork used for the series. Whether you think of Elton John’s “Your Song” or Aloe Blacc’s “The Man,” the words “you can tell everybody” mean the same basic thing: you can be proud enough of what is going on to want to tell every possible person. And what will you tell them? That you are loved by someone significant! This is, very easily, the message of every person – because we are all loved by God in Jesus. Jesus is certainly someone significant (as we’ll see especially well on Easter Sunday) – and he loves you. So what can you do? You can tell everybody. Note: This 3 week series was designed to begin two weeks before Easter and end on Easter Sunday. It also includes Maundy Thursday and Good Friday services.